According to researchers led by Dr. Emily Holmes at Oxford University, Tetris may be a useful tool for those suffering from Post-Traumatic Stress Disorder (courtesy BBC News). A group of volunteers was shown a series of traumatic images (awful injuries, I think), and half were then given Tetris to play for 30 minutes. Those who played the game experienced fewer flashbacks (recurring images from the experience) in the following week than those who did not. The researchers readily admit that "translating their findings into practical applications could prove difficult." But the essence of the experiment is interesting: that the focus demanded by Tetris "interferes with the way sensory memories are laid down in the period after trauma and thus reduces the number of flashbacks that are experienced afterwards." 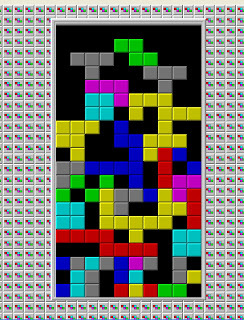 I should've played Tetris after I saw Manos. Perhaps playing Tetris isn't what people suffering from real trauma actually need. But it's neat to know what games can tell us about how the mind works. They engage so many aspects of the brain, that perhaps focused game development could lead to games as an active form of therapy or research. Get on this, people smarter than I!